These 1" web style window nets are available in a variety of colors and two sizes, 18" x 24" and 21" x 24". They are not SFI approved. 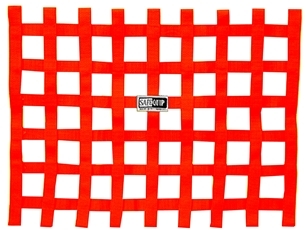 - Select - Window Net-Yellow-18" x 24" Window Net-Black-18" x 24" Window Net-Green-18" x 24" Window Net-Orange-18" x 24" Window Net-Blue-18" x 24" Window Net-Red-18" x 24" Window Net-Yellow-21" x 24" Window Net-Green-21" x 24" Window Net-Orange-21" x 24" Window Net-Blue-21" x 24" Window Net-Red-21" x 24" Window Net-Black-21" x 24"